David Zaharoff, University of Arkansas. FAYETTEVILLE, Ark. – Researchers at the University of Arkansas have been awarded $1.5 million from the National Cancer Institute at the National Institutes of Health to develop new molecules and biopharmaceuticals that enhance a patient’s immune response against tumors. The goal of the five-year grant is to help clinicians attack hidden metastatic tumors and prevent cancer recurrence, said David Zaharoff, the principal investigator for the project. Metastasis is the development of secondary malignancy away from the primary site of cancer. Zaharoff refers to breast cancer as an example of the importance of striking at metastasis. The overwhelming majority of breast cancers are detected early; tumors are removed and patients receive chemotherapy, radiotherapy, hormone therapy or a combination, depending on the stage of disease. Usually, these treatments are successful and the patient is given a clean bill of health, because available diagnostics show no detectable tumors. But in reality, many patients have microscopic, undetectable tumors that have already seeded in the bone, brain or liver. For this project, titled “Biopolymer-based strategies for local delivery of cytokine therapeutics,” Zaharoff will collaborate with Suresh Kumar, associate professor in the department of chemistry and biochemistry at the University of Arkansas. Zaharoff will focus on delivery systems and biomaterials, while Kumar will focus on protein biochemistry. Zaharoff works primarily with cytokines, which stimulate the body’s immune system to attack a range of cancerous tumors. He has demonstrated success with Interleukin-12 (IL-12), a powerful cytokine that, in a previous study, eradicated bladder tumors in mice when he combined the cytokine with chitosan, a natural polysaccharide that enhanced the delivery of IL-12 and its adherence to tumors. Zaharoff is holder of the Twenty-First Century Professorship in Biomedical Engineering in the College of Engineering. With previous support from his endowed professorship, the Arkansas Biosciences Institute and the University of Arkansas Women’s Giving Circle, he has now received more than $3 million in competitive state and federal grants. The University of Arkansas provides an internationally competitive education for undergraduate and graduate students in a wide spectrum of disciplines; contributes new knowledge, economic development, basic and applied research and creative activity; and provides service to academic and professional disciplines and to society in general, all aimed at fulfilling its public land-grant mission to serve Arkansas and beyond as a partner, resource and catalyst. 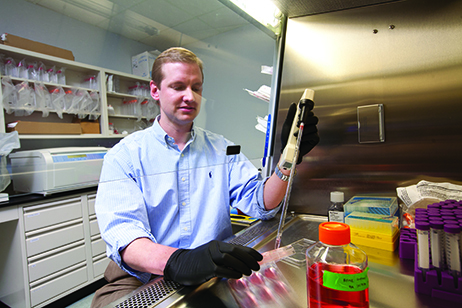 The Carnegie Foundation classifies the University of Arkansas among only 2 percent of universities in America that have the highest level of research.